I’ve had a busy week, and my body has decided to request that I slow down. As soon as I started my drive home from the studio, I started to crash. The next morning I lay in bed as my incredible husband got up with Tater, and I was able to sleep until the late, late hour of 8:45. In Mom Time, that’s pretty close to sleeping until noon. As I lay in bed, trying to pull myself together and trick myself into thinking I’m not actually sick, I watched this, this and this, and laughed so hard I think it worked. Maybe it’s true what they say about laughter and that whole “Best Medicine” thing. And on Thursday I leave for the Foster Farms Cook-Off. I’ll be competing against 4 other cooks for $1,000 and a trip to Napa for the Cook Off Finals with a prize of $10,000. Wish me luck! I’ll be posting on twitter and instagram as the contest goes along. And now, the recipe. I bought a huge bag of Masa to make corn tortillas with, and if you have never made corn tortillas, you really, really need to . They’re so good, nothing like those cardboard disks they sell at the store, and they take about 5 minutes. The flavor is so good, I’ve been throwing the corn flour into everything, I’m totally in love with it. 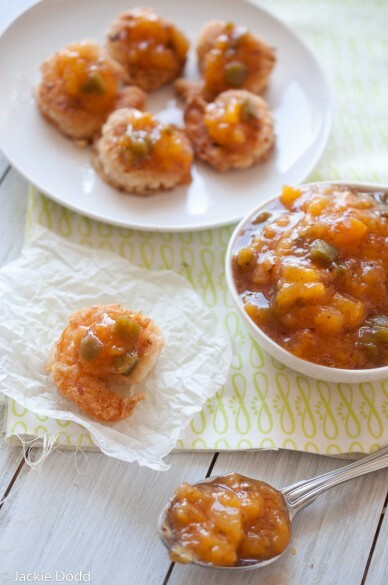 And the Jalapeno Peach Jam I also used on pork chops. So Good. Add the raw shrimp and coconut milk to a bowl. Chill in the fridge for about 45 minutes while you make the jam. In a bowl, combine the masa, coconut, salt, pepper and pinch cayenne. One at a time, remove the shrimp from the coconut milk and allow to drain a bit before adding to the cornmeal mixture. Coat the shrimp well in the corn meal mixture. Heat oil in a large skillet over medium high heat. Add the shrimp and cook until golden brown, about 3 minutes per side. Remove from heat. 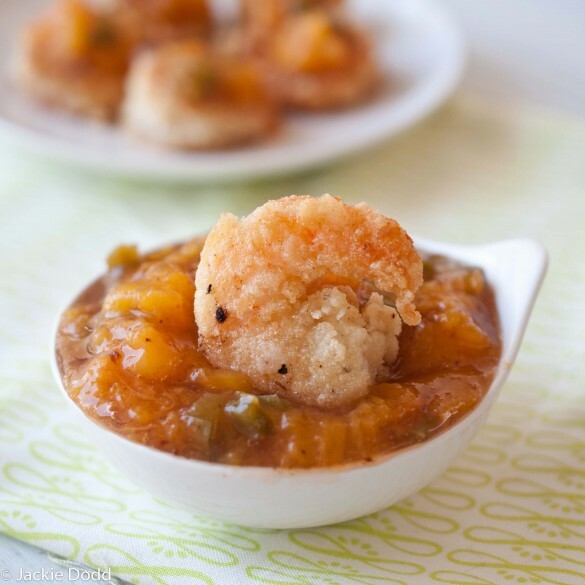 You can either top the shrimp with the jam or serve the jam as a dipping sauce. You are such a natural on TV! I’m so proud of you Jackie – you rock! And I totally need to make that dip, as well as this shrimp dish. I always have masa harina on hand so I’ll be making this very soon! Thank you! The dip was cleaned out about two minutes after the segment ended! Good luck with the contest! I adore this recipe!!! It sounds incredible, especially the jam. This sounds amazing! Love the combo of flavors here. I know you’re going to rock the competition, by the way – good luck! I was hoping that everyone assumed I was on a bluetooth, and then I stopped caring! Haha! Yeah, you know many people watch the mid-day news! YOU TOTALLY ROCKED IT! Huzzah! You absolutely rocked it! I had no idea bout the Beer stuff either-love! I also adore beer-my bachelorette was with the Brew Master for the Chicago Beer Society. I just started doing cooking segments for my local news channel and can relate to all the work that goes into just 5 minutes! Great job! And good luck next weekend. Thanks Mags! Such a strange question for a cooking segment!